Russia on Tuesday announced the start of the largest war games in its history, mobilizing tens of thousands of troops for the drills that will also see Chinese troops take part, and that has prompted complaints from the North Atlantic Treaty Organization (NATO) that it's "a rehearsal for a major conflict." Add Russia as an interest to stay up to date on the latest Russia news, video, and analysis from ABC News. Russia's Ministry of Defense said that 300,000 troops will participate in the exercise called Vostok ("East") 2018, that is taking place in the country's far east, close to Mongolia and China. Thirty-six thousand tanks, 80 ships, and almost 1,000 aircraft are also taking part, according to the ministry. The weeklong exercises reprise massive Soviet war games that took place at the height of the Cold War. They have been held every four years since Russian President Vladimir Putin revived them in the mid-2000s, but, this year, Russia's military said they are on an unprecedented scale, passing the previous largest that was held by the Soviet Union in 1981. Chinese military vehicles through a field in Chita, Eastern Siberia, during the Vostok 2018 exercises, Sept. 11, 2018. 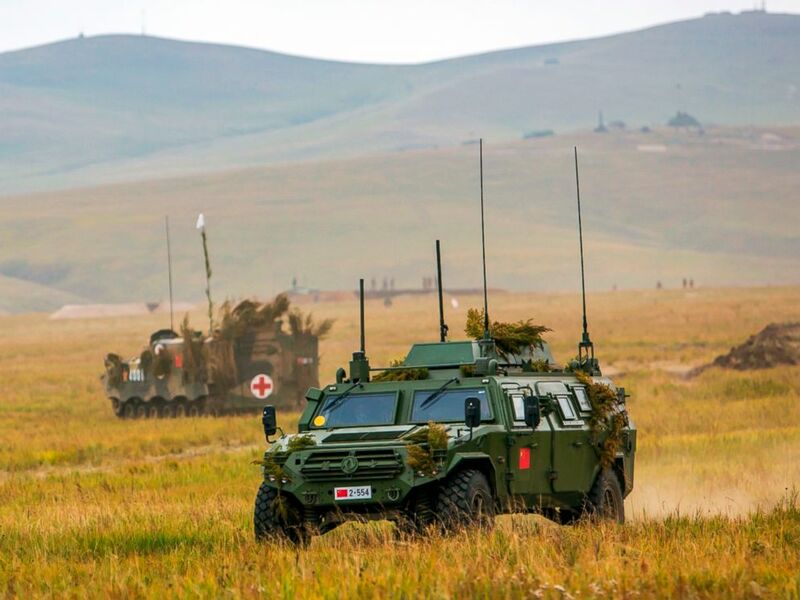 Besides their size, the drills have attracted attention because of the participation of Chinese troops, the first time they have been invited by Russia to take part in an exercise of this scale. China's military said it has sent 3,200 soldiers, as well as 900 tanks and armor vehicles. The drills began as Putin hosted China's leader Xi Jinping at an economic forum in Vladivostok. Putin is expected to visit the war games later this week. Speaking of the forum, Jinping said the two countries "friendship is getting stronger all the time." Experts said in reality neither China or Russia believe the two are close to a full-fledged military alliance, but the joint drills nonetheless reflected how much more cooperative the two countries' relationship has become, after decades of suspicion during the Soviet period. "This is a milestone for Sino-Russian military ties," Alexander Gabuev, a senior fellow at the Carnegie Moscow Center, wrote on Twitter. The Vostock exercise itself was originally established by the Soviet Union to prepare for a major war with China. The exercise is being held in areas that evened skirmishes in 1969 when the border disputes between the two countries threatened to scale into a full-scale conflict. Now, though, experts say the target audience of the drills is unambiguously not China, but the U.S. and Europe instead. As with the large-scale exercises Russia held last year on its western border, Vostock is viewed as intended to simulate a major conflict with NATO forces. Russia has substantially increased the size and frequency of its military exercises in recent years, particularly following its invasion of Crimea in 2014. That has alarmed NATO, which has responded by increasing its own presence in Eastern Europe. "It fits into a pattern we have seen over some time -- a more assertive Russia significantly increasing its defense budget and its military presence," Dylan White, a NATO spokesman, told reporters in late August. 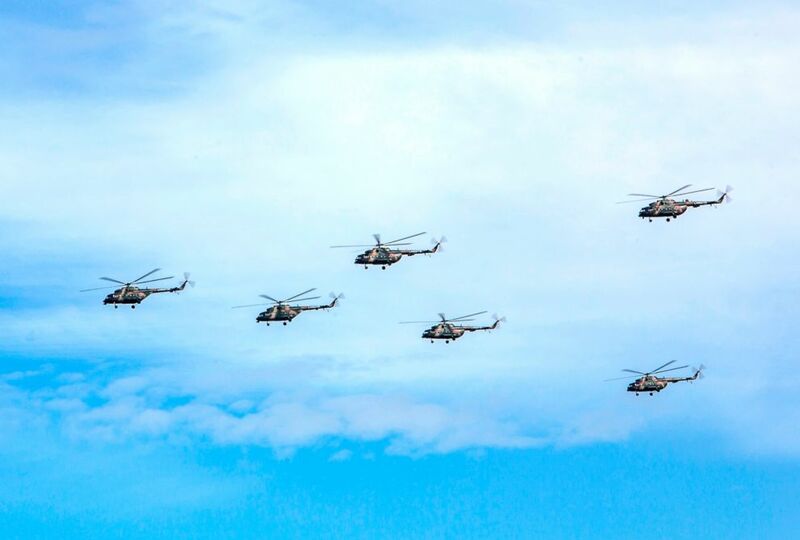 Russian military helicopters fly overhead in Chita, Eastern Siberia, during the Vostok 2018 exercises, Sept. 11, 2018. The Kremlin has insisted the exercises are routine and purely defensive. "These are very important drills and they are part of routine annual work to develop the armed forces," Dimitry Peskov, Putin's spokesman, told reporters Tuesday. Whereas during the drills on its western borders last year, known as Zapad 2017, Russia was accused of downplaying the number of troops involved, this year's war games are the opposite, with Moscow apparently eager to flaunt their scale. 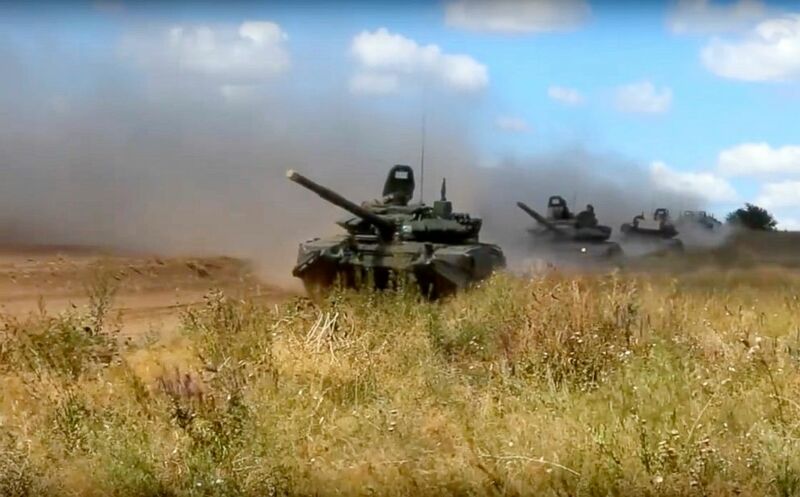 "Imagine 36,000 military vehicles moving all at the same time; tanks, armored personnel carriers, infantry fighting vehicles -- and all of these in conditions as close to a combat situation as possible," Sergey Shoigu, Russia's defense minister, said this month. Most experts say the figure of 300,000 is likely an exaggeration with not all of those actually taking part in the field exercises. Vostock includes many smaller scale exercises that happen every year and obsolete equipment has also been put into use, apparently to inflate the war games size, Jack Watling, an expert at the Royal United Services Institute (RUSI), wrote in an article this month. "It is important not to exaggerate the significance of the Vostock 2018 drills," Watling wrote. "There is also an element of theatre in this exercise." Tanks roll during the military exercises in Chita, Eastern Siberia, during the Vostok 2018 exercises, Sept. 11, 2018. The drills, however, allow Russia to practice mobilizing and effectively transporting a large number of forces. While simulating a great power conflict, experts say the drills do not mean Russia is preparing to fight with NATO rather, some say, Moscow is using the war games as a form of aggressive diplomacy, meant to impress and intimidate western countries and to persuade them to be more accommodating of Russia's interest. Watling, an expert at RUSI, said the drills also help Russia and China develop their capacity to make small-scale interventions in hotspots overseas, as Russia already appears to be doing in the Central African Republic, as a means to have more heft on the world's stage. "The key question is not whether Russia will launch a war against NATO," Watling wrote, "but where Russia -- and China for that matter -- aim to use their burgeoning capacity for expeditionary logistics and combined operations to project power."